The porro prism Navigator Pro Series is the choice for recreational boaters, weekend anglers and hobby sailors. It offers exceptional performance for the price with many of the features found on premium, world-famous Steiner marine binoculars. Built to excel in tough marine environments, they will provide a lifetime of use for water enthusiasts. Navigator Pro 7x50 is rated 5.0 out of 5 by 13. Rated 5 out of 5 by HP2DAY from Excellent clarity, and durabilty i bought 7-50 navigator with steiner float strap. first off at the prices these people charge i was worried i might get some china knock offs. i took about 3 days before they sent response that they were shipping and i had them 2 days later. perfect new sealed box , as advertised. these bins have wonderful clarity, and i went out after dark and was surprised by there light gathering ability. i can only say are built like a tank. and are a bit heavy to hold for extended periods of time. the float strap is nice in that when you put it in the case that comes with them it perfectly wraps around three of the four sides giving them an extra bit of padding incase they get knocked around on the boat. i did test with strap and they will float binos. and no leakage occurred ,or fogging of lenses.i feel confident these will last avery long time. Rated 5 out of 5 by Gailforce from Excellent Quality I've given up on lower priced, mass market glasses and I'm glad I finally purchased these. The magnification and clarity for use on the water is superb. Having had other brands with compass and built in light, I chose these for their ruggedness, clarity and basic function and I am not disappointed. My online retailer included the floating Steiner Clic-Cloc Floating Strap (S7680), which adds comfort to these glasses which are slightly heavier than others. Rated 5 out of 5 by Nanf from Love these binoculars I tried the Commanders but they were not in my budget. The Navigator Pros are every bit amazing. My friends thought I was nuts for wanting these but when they looked through them they were all very impressed. Rated 5 out of 5 by Capt tom from As a retired professional land surveyor and now an active ships captain l know the value of excellent optics, that is why I chose Steiner. Rated 5 out of 5 by B2345 from Quality Binoculars I bought the Navigator Pro 7x50 to replace an old pair of Bushnells that I was using on my boat. These binoculars are built to stand up to some hard use, they are solid and definitely not light weight. The image clarity is great and I like the auto focus feature. Rated 5 out of 5 by Junior navigator from Love my Steiner Binocs I have dreamed of having Steiner binocs for many years, and now I do! 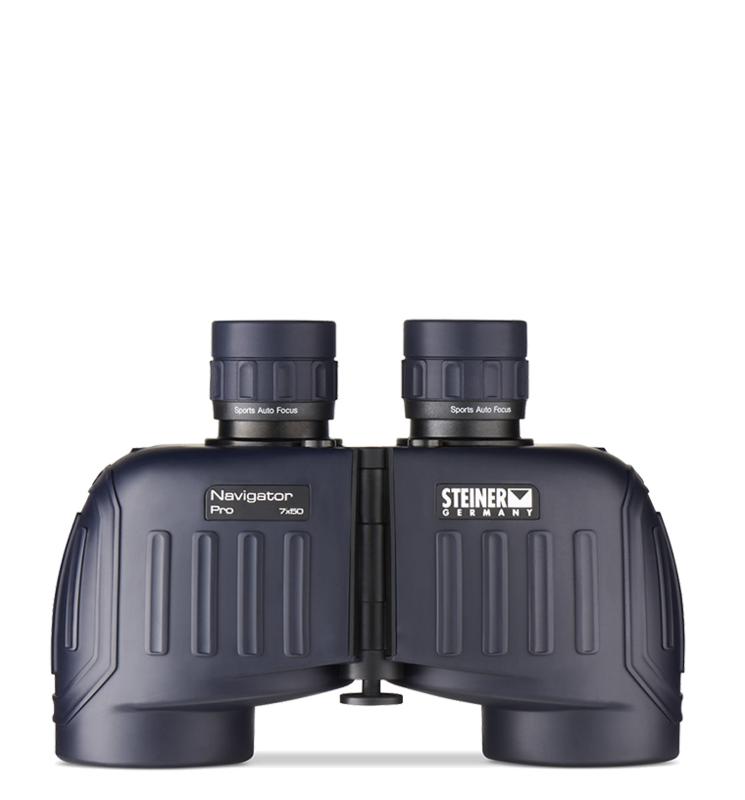 Rated 5 out of 5 by ErnestoR from Steiner - Best Binoculars I have ever used! This is my second pair of Steiner Binoculars. The Marine series is great because being waterproof it is also sand-proof. Also not to have to focus is fantastic! All other binoculars I have tried require constant adjustment that detracts from viewing. Rated 5 out of 5 by Sroozie from Delivers as promised! Have used now for about a month and couldn't be happier. It is easy to focus, feels good in my hands and gives me the detail I was looking for. Just right for watching whales and birds here in Southern Baja. Does the navigator 7x50 have a strap? if not can u buy a strap and install? Yes, the Navigator's come with a strap. I purchased the Navigator Pro 7 X 50c. &nbsp;Which floating strap will go with it? There seems to be two different straps with the ClicLoc system. Hello, You would want strap 768. The Mariner 7X50 Binoculars do not have a close enough interpupilary distance to suit my wife's eyes. Do you have a suggestion? is there any inbuilt compass in Navigator Pro 7X50 ? item no 7655? Does the Navigator 7x50 have a built in compass? Are the lens multi coated anti reflective on the Navigator pro? Lenses are multi-coated, but not anti-reflective. Marine series lenses are coated with a blue color to cut the glare off the surface of the water.